Corey Welch at the Grand Canyon. 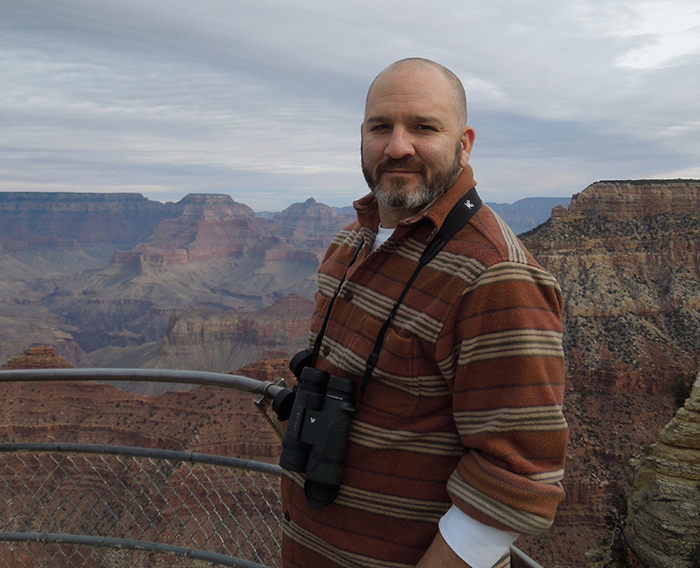 Corey Welch, Director of the STEM Scholars Program at Iowa State University, talks about how his life experiences helped him obtain a PhD and how he inspires students to reach their educational and career goals. How did you become interested in science, and how has your background influenced this experience? I used to ride the Northern Cheyenne Indian Reservation roads in Montana with my grandfather. We would see animals like bison, black bear, badger—all these animals most people see in natural history museums. Growing up, I remember my grandmother had a bird feeder on the reservation, and I was intrigued by all of the bird diversity. I believe this experience made me vertebrate biased for sure; I am a bird and mammal maniac! I am the first one in my family to finish college, so this was a big financial and emotional investment. There is a lot of pressure when your family has invested so much faith in your abilities. I went to college just interested in science and knew that I didn’t want to be pre-med. However, at the time, I also didn’t know about grad school. While an undergraduate, I was encouraged to apply for a summer research program, and those ten weeks transformed my vision of a career in science—and the best part was, you could get paid to do it. My family was supportive of this idea, as it meant I didn’t have to accrue debt while in school. As an undergraduate, I continued to explore different areas of science, so I took courses in mammalogy and ornithology and fell in love with grasshopper mice, a carnivorous rodent that howls. I wanted to understand the behavior of this animal, and that was the really interesting project that got me into grad school. I’ve been trying to slowly educate my family about the life of an academic, as in my graduate training they would often ask, “When are you moving back to Montana and getting a real job?” Because of this, I often encourage my students to describe themselves as a biologist (or whatever branch of science they’re pursuing) early on, so as to own what they’re becoming, especially for first-generation and low-income students. For these students, just being in a college biology course puts them ahead of a great percentage of the population. I grew up low income, first generation, Northern Cheyenne, and I also look white. So the reality is that I had a bit of “coverage” when dealing with some of the same issues that natives and other people of color face. Being aware of these facets of my identity is what influenced my desire to continue progressing towards getting a PhD. What impacted your decision to work in your current position? It’s complicated! During my postdoc, my original vision was that I thought I was going to be at a tribal college and do molecular and conservation biology. But I met a woman—who later became my wife, and I had to make a decision between two jobs: a non-tenure track teaching job at a small college or a job working as the program coordinator for the Biology Scholars Program at UC-Berkeley, the same institution where my wife was a postdoc. Managing the two-body problem is a concern that a lot of PhD scientists are faced with, but I made the decision to go with my wife, and I accepted the position as a program coordinator. As I worked with students through mentoring and advising, I was impressed with the impact it had on them, and I loved it! Within a few months of working as a program coordinator, I knew I wanted to run my own program someday, so I began looking at developing those skills, and I am now the director of the STEM Scholars program at Iowa State University. I love what I do because I like helping people by lowering barriers for students while educating scientists about the recruitment and training of underrepresented populations. What does a typical day of work look like for you? 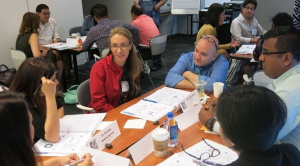 Welch working with URM PhDs at the Linton-Poodry SACNAS Leadership Institute, July 2017. My days depend on what time of the year it is. In the fall I teach a seminar class for underrepresented populations on how to navigate STEM majors. Typically, I meet with students every day, and I meet with my dean every other week. I also write grants, so I might be spending time doing grant preparation. I give a few departmental or National Conference talks per year on how to diversify a college or program. I am also involved with the SACNAS (Society for Advancement of Chicanos/Hispanics and Native Americans in Science) organization on a national level, where I am the secretary-elect for the Board of Directors and I help facilitate a Leadership Institute for URM STEM PhDs each summer. This relationship with SACNAS has led to a colleague, Lynn Villafuerte (University of Kansas) and I developing an exciting mentoring workshop at the SACNAS conference whereby we match PhDs with undergraduates by career interests/demographics for a 1-on-1 mentoring meeting. It has grown each year and we just had over 250 mentoring meetings within a single workshop! So basically there’s not a nice set pattern for my day-to-day. My STEM Scholars program also launched last fall so I’m not as structured as I would like as yet. I currently have thirty-one students and my goal is to have two hundred. 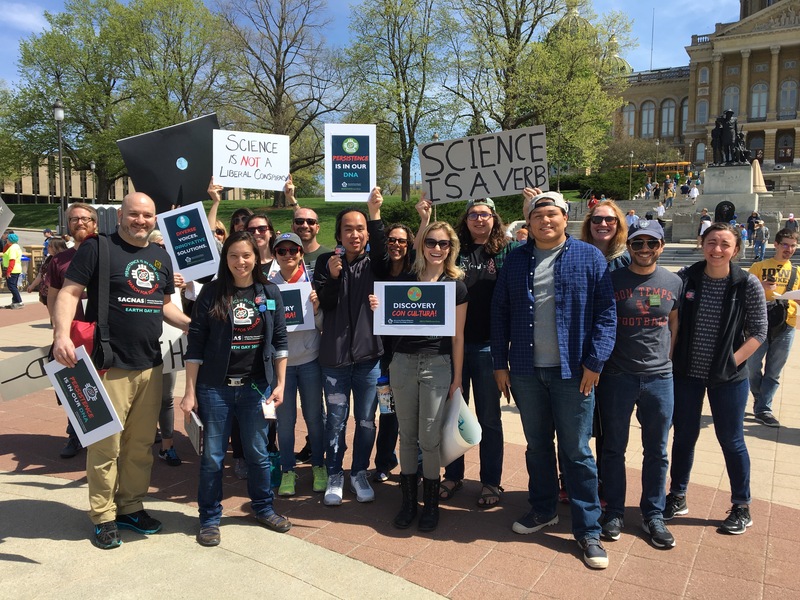 Welch at the March for Science in Des Moines in April 2017. What is the most rewarding aspect of your job? Definitely the students! I love seeing their eyes light up at the prospect of what is possible for their careers. There are a lot of issues in higher education, such as biases, that are long-term problems. However, another rewarding aspect of my job is seeing institutional changes, and long-term changes slowly coming into effect and knowing that other faculty members are having a positive impact on their students’ lives. The day-to-day that pushes me through is talking with a student and helping them navigate a problem that may or may not be a big problem in the grand scheme of things, but in that moment it’s the biggest thing that’s holding them back. They know they can come to my office, where I have a box of Kleenex, and we can talk/cry it out, and they can move forward. While an undergraduate, I didn’t have anyone that I trusted to fully advocate for me. I remember one semester, my Native grandfather died, and my GPA dropped to a 1.8 from having to travel for the funeral, in addition to emotional turmoil. Because of this, I try to be the person that I needed at that time in my life for my students now. How have mentors helped you along your career path? Many people have contributed to me being where I am now, it takes a village! My mom and grandparents and so many other family members have helped in various ways, such as motivating me to keep going when I wanted to quit. My undergraduate professor, Dr. Tom Darrow, literally made me apply for summer programs, which was what opened my eyes to the possibilities of a career in science and solidified my science identity. The person who recruited me to the University of Kansas definitely had an influence on me—I was the only Native American in that program, and the first African-American to receive a PhD from that department was also recruited by him. Scott Edwards, a molecular evolutionary biologist and ornithologist, was also very influential and in many ways, remains so. My most recent advisor was Dr. John Matsui at UC Berkeley, who established a nationally-known Biology Scholars program and is a national leader in making STEM education more equitable for underrepresented populations. I admired how he talked with students and listened to them, gave them the tools to become leaders, and I learned from him how to make small institutional changes even in the face of adversity and institutional inertia. I continue to seek and foster mentor relationships so I can be a more effective communicator and leader in higher education. Is there any additional training you wish you had during your graduate and postdoc career to prepare you for this position? More statistics training would be helpful in my current work, as I do some number crunching. General grant writing skills, as I also do that in my current position. I work with my KU colleague, Lynn, to teach grant writing to SACNAS students, and we also started a grant writing weekend recently for senior undergraduates, post-bacs, and graduate students. Some grad programs are better at having structured training for grad students and postdocs, but there’s not a uniform way that it’s being done across the country. What do you look for in students applying to your program? 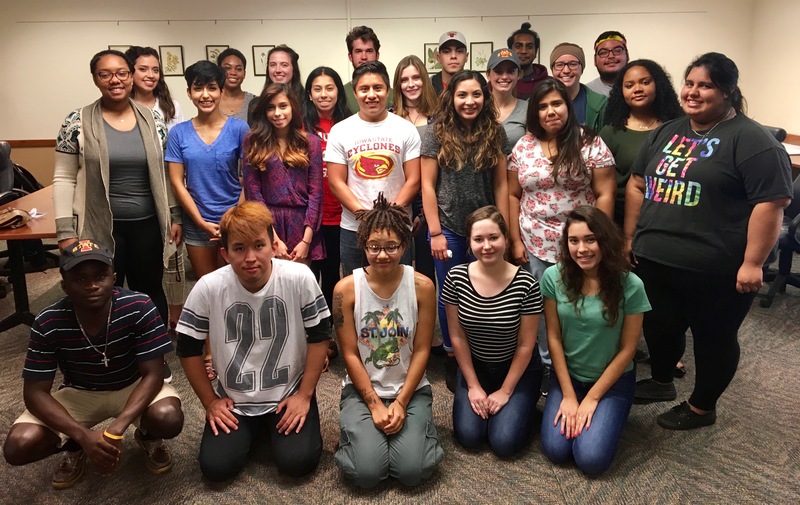 Welch with his STEM Scholars, Fall 2017. I look for two things: the first is passion for science, how they write about it, and how they talk about it. The second thing is a history of giving help. The former is crucial and the latter is common to most minority families and communities. One unique thing about the program is that once you’re in it, you’re in it for life. I will work my students after they graduate from Iowa State, but I will also call on them to come back and share what they know and have experienced with the latest batch of STEM Scholars Program students. Do you have any regrets as far as career choices? No! It’s not the destination, it’s the journey. I sometimes think, what if I had worked on another project instead of the one I did work on? But playing the what-if game is not useful. Elaine Welch is a liaison on the Early Career Scientist Career Development Committee and is an Associate Human Molecular Geneticist at PreventionGenetics. In addition to her work in clinical genetics, Elaine is committed to mentoring early career scientists—especially those belonging to underrepresented minority groups—to help them successfully transition from academic training to varied career paths.